BEIRUT — Adnan Hassan, a Syrian Kurd, finally has hope for himself and his people. Two years ago, Islamic State militants nearly wiped out his hometown, Kobani, along Syria’s border with Turkey and killed 10 members of his family. Now with the militants driven out and going down in defeat, a new university is opening in the town, and Hassan will be its professor for Kurdish language and literature. It is the first university in the self-administered Kurdish areas, and the first in Syria to teach Kurdish. The future of his people, Syria’s largest ethnic minority long ostracized by the government, could not look better, he said. Across the border, Iraq’s Kurds have sparked a major confrontation with their neighbors and Baghdad by holding a referendum for outright independence. Syria’s Kurds, meanwhile, are making major advances toward their own, less ambitious goal: winning recognition for the self-rule they seized during Syria’s war. They say their aspirations for a federal system in Syria may now find more international and domestic support, and they are positioned as a player Damascus must reckon with in any final resolution of the conflict. Perhaps more importantly, they have land. Backed by the U.S. in the fight against ISIS, Kurdish forces control nearly 25 percent of Syria. They hold most of the northern border with Turkey and have expanded into non-Kurdish, Arab-dominated areas. The Americans have set up bases there to provide battlefield support for the Kurdish-led Syrian Democratic Forces, as well as the training and advising of security forces and the new civilian administrations in liberated areas. “In Rojava, we have a federal project. 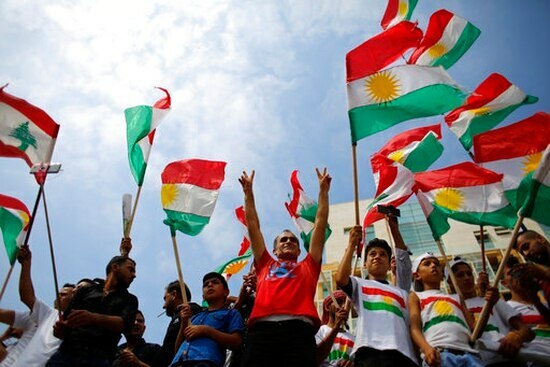 In (Iraqi) Kurdistan, it is the long awaited state. The two complement one another in realizing the Kurds’ aspiration for a dignified life,” Hassan said. It is a remarkable turnaround. Syria’s Kurds were about 10 percent of the pre-war population of 23 million, but Damascus had long suppressed any expression of their identity in the majority Arab nation. 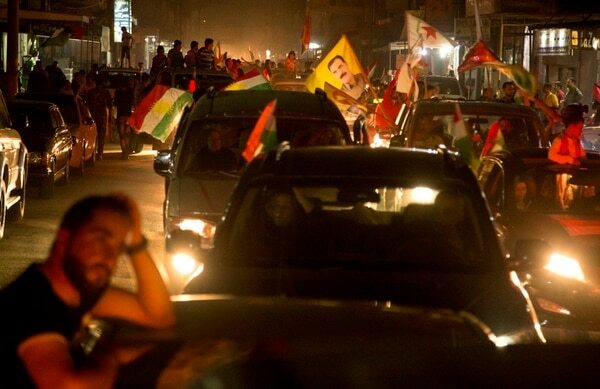 Jubilant Syrian Kurds celebrated their neighbors’ independence referendum by flying Iraqi Kurdish flags alongside the flags of their own militia from cars honking down the streets late into the night. 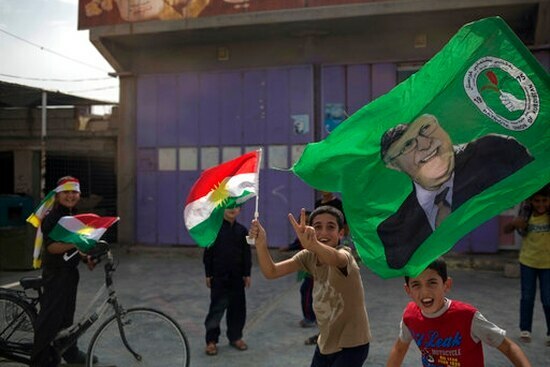 Iraqi Kurdistan’s referendum sparked furious opposition from Iraq’s government, as well as Iran and Turkey, who fear it will fuel secessionist movements among their own Kurdish minorities and dismantle the map of the Fertile Crescent in place since World War I. There was also a backlash from the Arabs. Lebanon’s Hezbollah accused the U.S., Saudi Arabia and Israel — the only state to support Kurdish independence — of manipulating Kurds to start another war. In a first, President Bashar Assad’s government said it may be ready to talk to the Kurds. Syria’s Foreign Minister Walid al-Moallem recently noted Syria’s Kurds want “some form of self-administration” within Syria unlike Iraqi Kurds’ push for independence. “This is something negotiable and can be discussed. When we are done with fighting Daesh, we can sit with our Kurdish sons and find a formula for the future,” he said, using the Arabic acronym for IS. Turkish forces, with Syrian allies, have skirmished with Kurdish forces holding the northwestern town of Afrin. And Turkey announced Saturday it was launching an operation in the nearby Idlib province, controlled by al-Qaida-linked fighters, in part to push Kurdish expansion there. 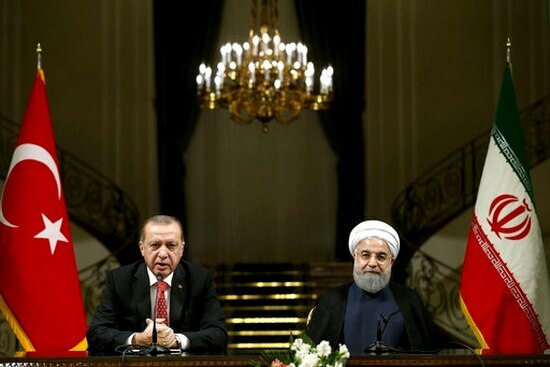 “The United States can limit Iran’s freedom of action in the region by becoming a major patron for the Kurds,” while trying to be “polite with Turkey,” Joshua Landis, a Syria expert and professor at the University of Oklahoma, said recently to Syria Direct. Syria’s PYD is ideologically affiliated with the Turkish Kurdish PKK, inspired by its leader Abdullah Ocalan. For almost 20 years, Ocalan found refuge in Syria until Damascus expelled him in 1998. He has been imprisoned in Turkey since but is omnipresent in northern Syria. Affectionately referred to as “Apo,” or uncle, Ocalan’s vision mixing Marxism, social egalitarianism and a revolution of women who share leadership roles with men remains common parlance among Kurdish fighters and officials. Graffiti about women’s liberation and the imprisoned Ocalan are pervasive. 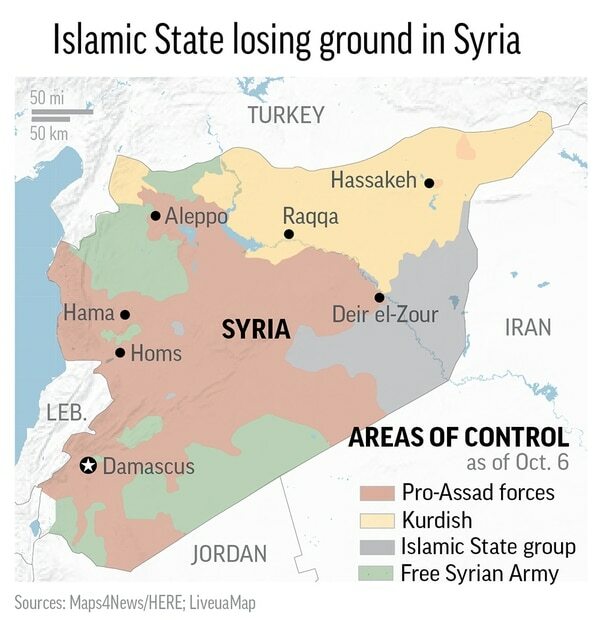 Washington found in the secular-leaning, disciplined fighters its main leverage in Syria. It advised them to rebrand to distance themselves from the PKK. U.S. Army General Raymond Thomas, head of Special Operations Command, described it as a “stroke of brilliance” to include democracy in their new name: the Syrian Democratic Forces. “We don’t want to fight with anyone, but we will defend ourselves,” he told the Al-Monitor news site in September in his first comments to the press. The ruling party of Iraq’s Kurdish zone has long cultivated ties with Ankara, the main enemy of Syria’s PYD. Land-locked Iraqi Kurdistan depends on Turkey for access to the outside world for its oil. When the PYD first set up its self-rule administration early in Syria’s war, Iraqi Kurds closed their border with Rojava. Some believed the rivalry would ease with Turkey’s opposition to the Iraqi Kurdish referendum. But Iraqi Kurds are unlikely to further aggravate Ankara by softening their stance toward their Syrian counterparts. 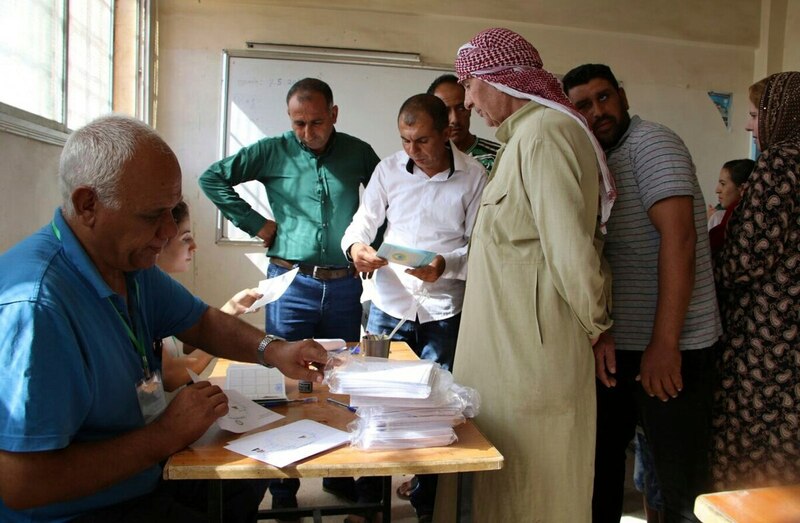 Days after the referendum, Syrian Kurdish officials from Europe trying to attend a PYD conference in Syria were denied entry at the Iraq crossing. The PYD’s internal rival, the once powerful Kurdish National Council, has allied with the Iraqi Kurds’ ruling party and refused to participate in the self-administration project. Many of its members now live in Iraq’s Irbil. Khaled Ali, an opposition member in Irbil, said his family had to take one of their youngest members out of Rojava before high school fearing he would be recruited by the militia. “There is excessive militarization of society,” he said. Still, confidence in the future is palpable in Rojava. Resources have poured in to rebuild destroyed towns like Kobani. Oil revenues from fields seized from IS and the government have boosted the administration’s coffers. While he is concerned some of his colleagues who rose to power may “become corrupt,” he believes the administration will correct course, guided by Apo’s views and “the sacrifices of martyrs.” And maybe work with other Kurdish parties.